I’ve gone on and on about the wonderful restaurants of San Francisco, just one epicurean delight after another, and all the little tasty places where you can get satisfying, if less ethereal, fare like the wonderful Belly Burger on Howard Street with its signature pork belly burger. I”m not kidding – the patty is ground up pork belly perfectly grilled. And when i’m less than pleased i normally just say nothing, but sometimes i get something so bad that it deserves mention. I’d call it tough love except it’s not love. It was raining the other day, so i was out in the Prius running errands and feeling a bit put on as i circled around blocks near my destinations hoping, hoping to reduce the distance i’d have to walk. So of course the appointed minute of my appointment with my barber drew closer and closer and i was reduced to parking a block and a half away, downhill. Made it on time but it nearly killed me. So afterwards, it struck me that i might as well stop to rest at the halfway point of the return journey at Gyro Express, that new place on the corner of 18th and Castro. I love good gyros, but haven’t had a really good one since the fine ones at Zorba’s in Hayward in the eighties. Thought this new place might be in the running. Alas, it isn’t. Hell, it’s not even close. I wish i could say the meat was tasteless, but it wasn’t. No, it was so bad that i didn’t even eat much of it, nor of the tired lettuce and pitifully thin yogurt sauce. The best i can say is that nothing was wrong with the pita. I was curious enough to look at the Yelp reviews and astonished to see that while many reviewers shared my opinion of the gyros, something like half them liked the restaurant. Well, yes, the servers are nice, but that’s not enough when they’re serving dreadful food. I’m thinking the owners have been writing their own reviews under assumed names. Don’t go. You owe it to yourself. 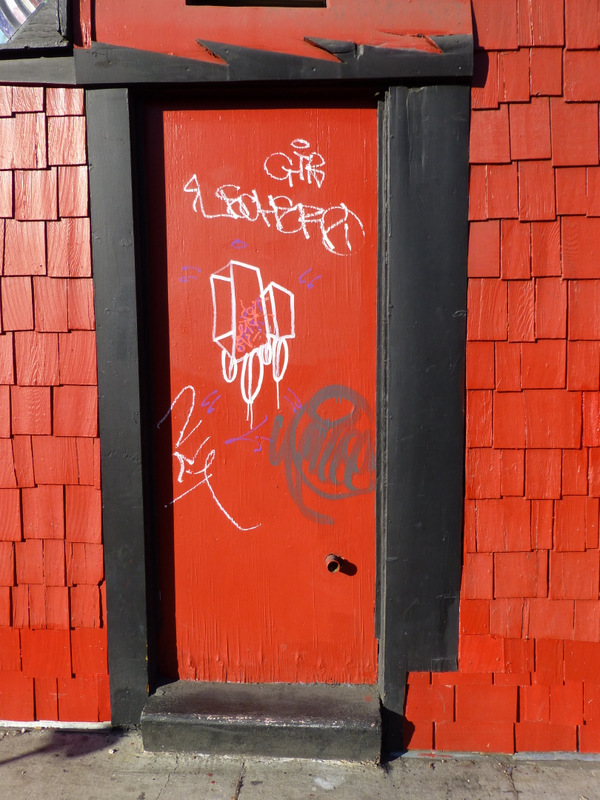 For today’s pic, an interesting door treatment on 14th Street, the back door for that pre-qualifying bar i discovered a few days ago. I particularly like their providing a speaking tube so you can get down on your knees and beg for admission.